For those who have yet to discover the pleasures of Showtime’s superb ½-hour comedy/drama series, Nurse Jackie, you are missing out on one of the great supporting performances on television. 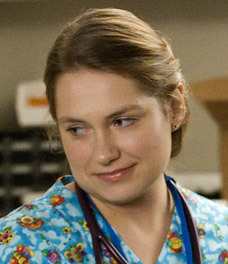 I’m speaking of Merritt Wever and her scene-stealing portrayal of Jackie’s plucky, colorful pattern scrub-wearing young protégé, Zoey Barkow. Zoey is a stock character for this type of medical show; she’s the slightly naive, innocent ER newbie who provides zany comic relief while learning the ropes from Emmy® winner Edie Falco’s seasoned, jaded, no-nonsense, drug-addicted, but damn-god-at-her-job, Nurse Jackie. Zoey is the kind of quirky character that could so easily be over-played and quickly spiral into caricature, or be under-played and get lost amidst the show’s excellent ensemble (which includes Eve Best, Paul Schulze, a hilarious Peter Facinelli and Anna Deavere Smith), but Merritt Wever, in a full body performance of impeccably well-timed mannerisms and affectations, imbues her with heartfelt empathy, kindness and admirable do-gooder gusto. Zoey is a wholly unique creation – at once supremely confident and yet deeply unsure of herself. She desperately wants to please those around her in the workplace, but she has no reservations when it comes to raining down her own particular brand of bubbly sunshine on her all-too-serious and sour co-workers. She’s uncertain of her skill set, but uncompromising in her character and how she approaches life. And when push comes to shove (mostly), Zoey has proved to be an exceptional young medical professional. So, check out Nurse Jackie and all hail Merritt Wever as she continues to reach heights that are deeply human and comedically sublime.